There is only one magazine which regularly inspires me enough, and I really recommend it. It's American, and sadly is only published every two months. I have no hesitation in saying it is my most favourite gardening magazine. Don't take anything negative from the word 'fine' in this magazine's name. It's full of real down-to-earth gardening articles, written by real down-to-earth gardeners. Fine Gardening is not just for your coffee table, although the pictures are extraordinarily beautiful. It won't patronise you with superficial journalistic tittle tattle, and you won't find any preciously cute articles here. 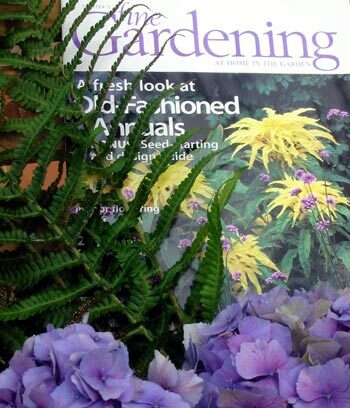 This magazine takes you seriously as a thinking, caring, intelligent gardener. It's brilliant, no matter where in the world you garden. Originally we both discovered these Fine magazines in our local library. It was then an easy matter to take out a subscription through the Fine Gardening website, which is every bit as good as the magazine.